Have you heard about this PNB MetLife’s Mera Term Plan? If yes, do you want to buy it? What are the benefits of it? Why you should buy it? Well, here we have put a review of the plan. Have a look. 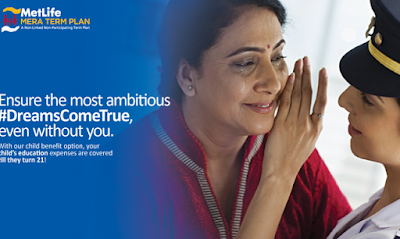 The PNB MetLife’s Mera Term Plan comes with protection and offers rising monthly income alternative 12% per annum. It also provides individual cover to the spouse in the same policy. Thus, suppose death of policyholder occurs then the beneficiary gets the lump-sum amount all future premiums for partner’s cover will be stopped. If you are a policyholder, you have to follow the instructions given below. 4. Select one or all from Mera Additional Benefits, Sum Assured, Coverage Term, and Premium Payment Frequency. The policyholder ca pick minimum and maximum sum assured from the table given below. 1. Lump-sum payment on death – With this option, the sum assured will be paid to beneficiary if policyholder dies. 2. Lump-sum + monthly income for 10 years – 50% upfront sum assured will be given as lump-sum and remaining will be paid as monthly income for 10 years. 3. Lump-sum + increasing monthly income for 10 years – 50% upfront sum assured will be paid as lump-sum and remaining will be paid as increasing monthly income for 10 years at 12% per annum. 4. Lump-sum + monthly income with child education support – Policyholder’s child’s age should be less than or equal to 15 years. 50% upfront sum assured will be paid as lump-sum and remaining will be paid as monthly income till child turns 21 years of age. 1. Nominate any other child whose age is less than 21 years. 2. Or continue with Death sum assured as lump-sum death benefit. Income Tax Benefit: Life Insurance Premiums paid up to Rs 1,50,000 are permitted as a deduction from the taxable income every year under section 80C. ⦁ On policyholder’s marriage: Equivalent to 50% of the current cover, maximum 5000000. ⦁ On the birth of the 1st and 2nd child: Equivalent to 25% of the existing cover, maximum 2500000. 2. Joint Life Cover: Policyholder can cover his/her spouse with this option; the cover will be 50% of the existing cover, maximum 5000000. 3. Free Look Period: If the policyholder is not convinced with the terms and conditions of PNB Metlife’s Mera Term Plan then she/he has an option to cancel the policy within 15 days from the date of receipt of the policy document. So, this is the PNB Metlife’s Mera Term Plan Review. You are getting multiple benefits in just one policy! Why to wait? Go get this policy today!